Nigeria stands at the threshold of history, as is set to have first gold refinery in the country. The refinery will be located in Mowe, Ogun State. According to a statement by Kian Smith, the refinery is coming to add value to the economy, gold miners and traders and will also increase revenue to the government, especially at a time oil prices have become volatile, leaving the economy in dire need of improved revenues from other sources. Bawa Bwari, minister of mines and steel development would be joined by the Ogun State governor, Ibikunle Amosun, and other functionaries from the public and private sectors for the ground breaking ceremony of the Kian Smith Gold Refinery on Thursday, December 13, the statement says. The indigenous firm adds that its vision is to contribute to the development of the Nigerian gold market as well as help in creating jobs in the economy. Udo Udoma, minister of budget and national planning, had recently announced in Abuja that the Federal Government has issued first gold refinery license in the country to Kian Smith, which would soon go into operation. 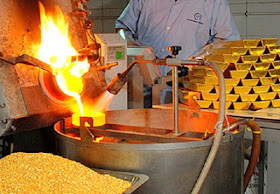 Hey Buddy!, I found this information for you: "First Gold Refinery In Nigeria Coming Up". Here is the website link: https://headlinenews365.com/first-gold-refinery-in-nigeria-coming-up/. Thank you.